I'm really looking forward to tomorrow's Super Bowl, it should be quite a battle. In preparation I was reading up and I found a link to Bodog.com, a gabling website with all the silly "Prop Bets" that you can make, like "What color Gatorade will be dumped on the winning Coach," "How many times will they show Kim Karsashian," or "How many times will they fully state the phrase 'Hurricane Katrina.'". Then at the bottom of the site, I noticed a bunch of bets involving the Half Time act, The Who. "How many times will Pete Townshend do his legendary windmill move?" "Will a member of the Who smash a guitar on stage during the half time show?" 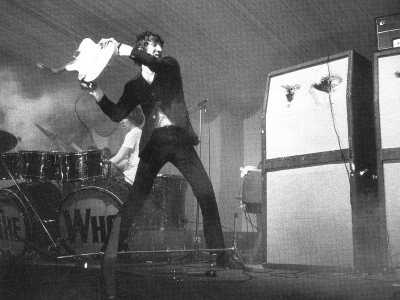 "If any member of the Who smashes their guitar what does the guitar hit first?" Anyway it has been a destructive few days here at Every Day, Another Song, so continuing with the theme here are tomorrow's Halftime Show acts strutting/smashing their stuff with "My Generation ."